ActiveCampaign has released their new CRM sales pipeline and contact scoring, which is directly built into the ActiveCampaign system. 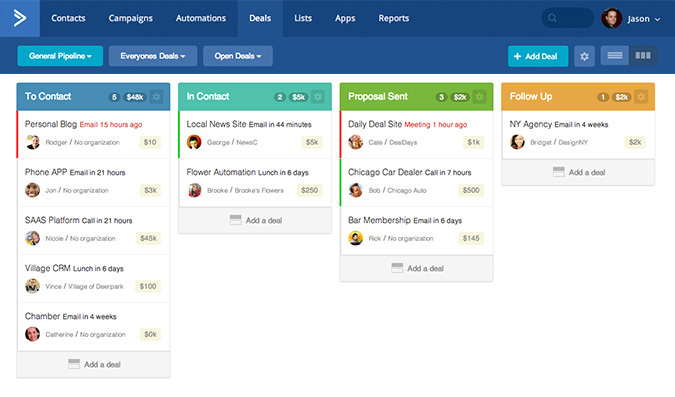 Here is a screenshot of the deals / pipeline view, which might remind you of a Trello “todo list” dashboard. Within the new CRM marketers can create custom deal pipelines, stages, task types, etc. As a lead comes into ActiveCampaign it can be placed into a pipeline. A marketer or sales manager could then move it to different stages as the sales process advances. 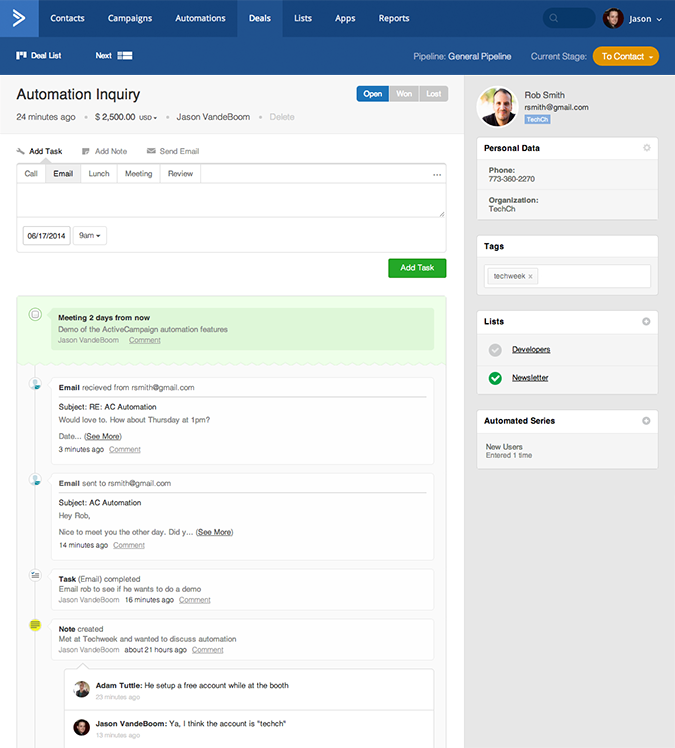 The Active Campaign automations being there to help move, update, and prioritize deals. A sales agent can send individual emails from within ActiveCampaign or connect any email account (Gmail, Yahoo, Outlook, etc..). Once connected you will see all related sent and received emails automatically within the Deal stream. Previously the ActiveCampaign ESP system would only allow you to start an automation from four different entry points and only pick one at a time. With the new release, the automations allows multiple entry points. A marketer can have a dozen start options and choose multiple options for when each automation will begin. At the same time Active Campaign introduced Contact & Lead Scoring within their platform functionality. It is free with all enterprise plans and a paid upgrade for small business plans. The scoring system allows dynamic increase and decreases of a score based on any marketing channel that you integrate with. So the score can be adjusted based on campaign interactions, individual email interactions, traffic/history on your website, custom events, sales data, etc. ActiveCampaign currently integrates with several CRM providers. Expect more CRM updates in the near future. The syncing of data with other CRM’s is something the Active Campaign tells us it is working on as well. Once that functionality is added to the ActiveCampaign software platform, it will allow the marketer to use a different CRM for sales activity while using ActiveCampaign as the marketing/ marketing automation engine. Also a new email designer / editor is in the works.